Bulgaria is saying Thursday last goodbye to one of its most controversial public figures – athlete and socialite figure Ivan Slavkov, aka Bateto (Big Brother). Bateto died Sunday from pulmonary virus and embolism, only 10 days before his 71st anniversary. The farewell ceremony will be held in front of one of Slavkov's most favorite spots in Sofia – the National "Vasil Levski" Stadium. Crowds of people, both officials and common citizens, are expected to arrive to pay their last respects. The funeral is also to bring together the entire football elite of Bulgaria. When Slavkov was leading the Bulgarian Football Union, the national team qualified twice for the European Championship – in 1996 in the UK, and in 2004 – in Portugal, and once for the World Cup – in France in 1998. Slavkov was born May 11, 1940 in Sofia. He graduated from the Technical University in Sofia and competed as a water polo sportsman in the team of Septemvri. In 1966 Slavkov's wife Svetla Marinova died tragically in a plane crash. Soon after that the widower married Lyudmila Zhivkova, the much-favored daughter of Bulgarian communist leader Todor Zhivkov. Slavkov was to be widowed again in 1981, when Zhivkova perished in a car accident. Bateto started his career as a journalist for prominent Bulgarian daily Trud, but then swiftly turned to the sports world. Till the end of the 1970s he was president of the Levski Sofia football team, combining that task with heading the Bulgarian National TV (1972-82). In 1982 he was chosen to chair the Bulgarian Olympic Committee, and in 1987 - for a lifelong member of the International Olympic Comittee. 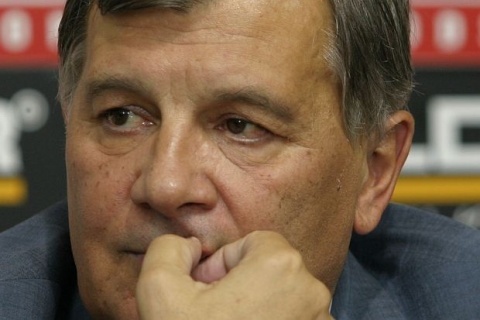 In the late 1990s and early 2000s Bateto also presided the Bulgarian Football Union. Slavkov gained international notoriety in 2004, when undercover BBC journalists apparently managed to "bribe" him to vote for London for the 2012 Olympics. The BBC subsequently aired their "Buying the Games" film, which caused Slavkov to be expelled from all international chairing positions he held at that moment. Ever since the 1970s, Slavkov has been notorious in Bulgaria as a social lion and a great womanizer leading an extravagant lifestyle. Over the 1990s and 2000s, Bateto gradually turned into a prominent social, political and sports commentator, noted for his sharp wit and uncompromising cynicism.